October 2015 Showcase- Read It Now! Our October 2015 Showcase has been sent to those on our mailing list, and can now be viewed online (just click the link below). Highlights in this issue include 19th century city views, maps from Jacques N. Bellin’s 1764 maritime atlas, Denton fish prints, Winslow Homer illustrations, and prints from our two most recent gallery shows, 20th Century People and Monotypes. Published in both traditional and digital media forms, we are now able to share our fantastic collection in a whole new way. We are already working on our next issue, which should arrive in time for the 2015 holiday season. To receive our next Showcase, just send us your mailing information, via email. The Old Print Gallery Showcase. Volume XXXVIII, October 2015. With the new fall season comes new prints for the gallery walls. We opened 20th Century People two weeks ago on one side of the gallery, and are in the process of hanging our “historic” side of the gallery with antique prints and maps which show off the full range of our gallery’s collection. Two new prints to this side of the wall are from Weinmann’s 18th century botanical masterpiece, Phytanthoza iconographia. Beta alba, Poiree blanc. No. 242. Johann W. Weinmann. Published in Amsterdam and Ratisbon. Copper engraving printed in color and finished by hand, 1736-1745. Average platemark 12 3/4 x 8″ (325 x 203 mm). LINK. Aloe Americana toberosa yuccae foliis. No. 53. Johann W. Weinmann. Published Amsterdam and Ratisbon. Copper engraving printed in color and finished by hand, 1736-45. Average platemark 12 3/4 x 8″ (325 x 203 mm). LINK. A truly ambitious project, the Phytanthoza iconographia includes 8 folio volumes and over 1000 plates, resulting in one of the most comprehensive reference on plants, flowers, and fruits of the eighteen century. The collection is impressive in both size and scope, both almost unparalleled in beauty. Weinmann utilized the talents of Georg Dionysius Ehret, a distinguished botanical artist credited with being the greatest influence on 18th century botanical painters, in addition to the help he received by N. Assam, B. Seuter, J.E. Rindinger and J. Haid. 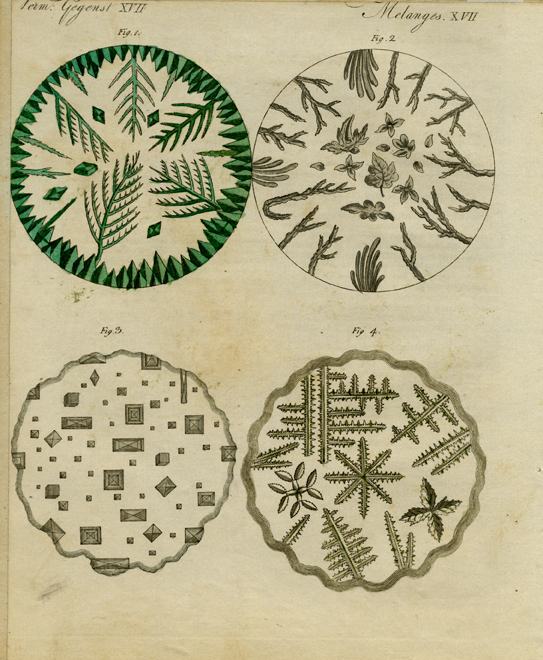 Ehret is responsible for roughly 500 plates, half of the images in the collection. Weinmann was one of the first printmakers to produce color printing from a single plate, resulting in a vibrant and cohesive image. 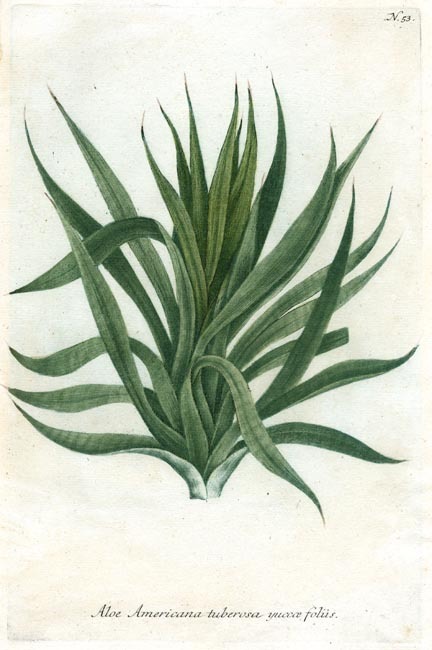 The two prints selected, Beta alba, poiree blanc and Aloe Americana toberosa yuccae follis are excellent examples of the rich coloration achieved by this single-plate process. Vibrant greens and blues are coupled with a warm yellow under tone, a combination that makes these botanicals pop off the creamy 18th century paper. Phytanthoza iconographia was published in both Latin and German editions, and a Dutch edition appeared in four volumes in 1736-1748. It was the Dutch edition that was brought to Japan in the early nineteenth century, and some of Weinmann’s illustrations were the source for those in Honzu zufu, the monumental Japanese botanical work by Iwasaki Tsunemasa. Honzu zufu was one of the two most important treatises on systematic botany in the Tokugawa period (1603-1867). To see more Weinmann engravings, or additional botanicals from the likes of Thornton, Bessa, Redoute, and many more, stop by our Georgetown gallery in Washington, DC. We have three new additions to our natural history inventory- several bird prints from Alexander Wilson’s “American Ornithology; or, The Natural History of the Birds of the United States.” One of America’s great naturalists and nicknamed the “father of American ornithology,” Alexander Wilson (1766-1813) learned much of birding from friend and fellow bird-enthusiast William Bartram. Working out of his father’s famous botanical garden in Philadelphia, Bartram taught Wilson how to draw, identify, and document different bird species. Wilson soon set out to document every species of bird in North America, an impressive undertaking that led to the creation of “American Ornithology”. 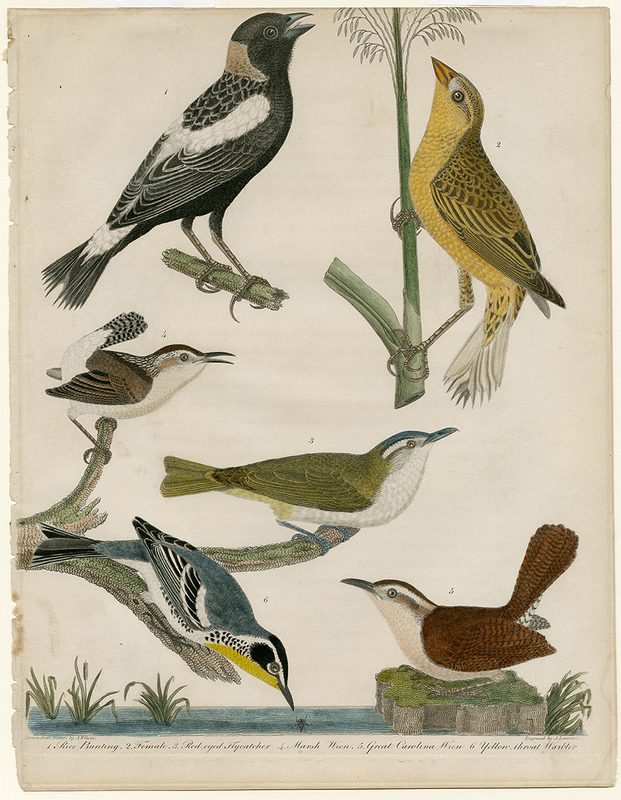 Nine volumes of “American Ornithology” were published during Wilson’s lifetime. Of the 268 species of birds illustrated, 26 had not previously been described. 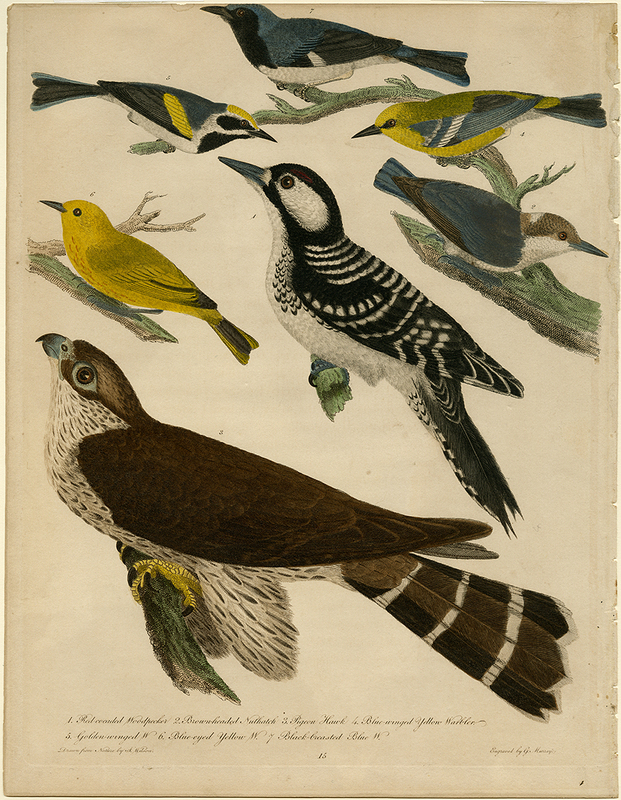 C.L Bonaparte published a supplement to “American Ornithology” in 1825-33, to complete what Wilson started, with prints by Titian Ramsey Peale and Alexander Rider. A second edition printed from the original plates was published by Collins & Co. & Harrison Hall in 1829. 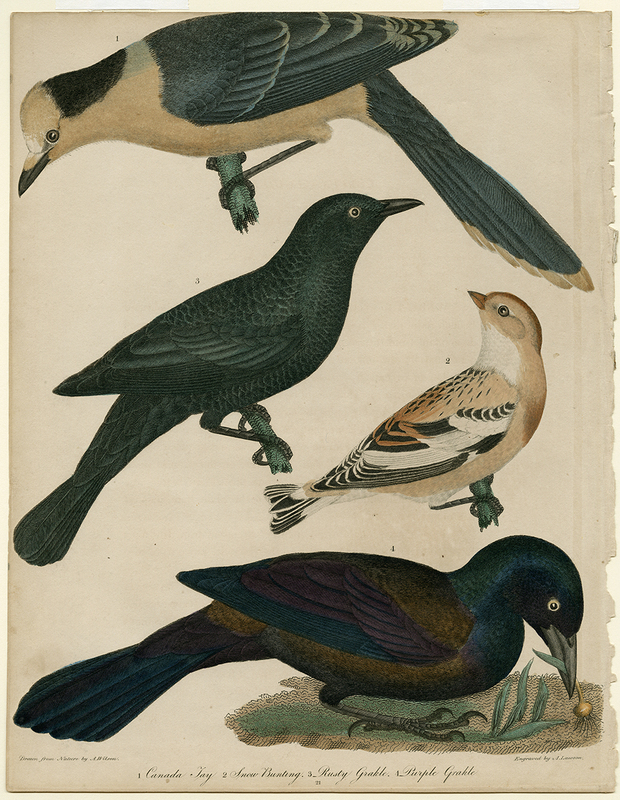 The three prints shown below are from the first edition of “American Ornithology”, published between 1808 and 1814. Engraved and hand-colored, these charming prints would make a beautiful addition to any print collector’s walls or personal collection. 1. Red cocaded Woodpecker 2. Brown-headed Nuthatch 3. Pigeon Hawak 4. Blue-winged Yellow Warbler 5. Golden-winged W. 6. Blue-eyed Yellow W. 7. Black-brested Blue W.
Alexander Wilson. Engraving, hand colored, 1808-14. Paper size 13 1/4 x 10 1/4″. Good condition and color. First edition. LINK. 1. Rice bunting. 2. Female. 3. Red-eyed Flycatcher. 4. Marsh Wren. 5. Great Carolina Wren. 6. Yellow-throat Warbler. Alexander Wilson. Engraving, hand colored, 1808-14. Paper size 13 1/4 x 10 1/4″. Good condition and color. First edition. LINK. 1. Canada Jay, 2. Snow Bunting, 3. Rusty Grakle, 4. Purple Grakle Alexander Wilson. Engraving, hand colored, 1808-14. Paper size 13 1/4 x 10 1/4″. Good condition and color. First edition. LINK. 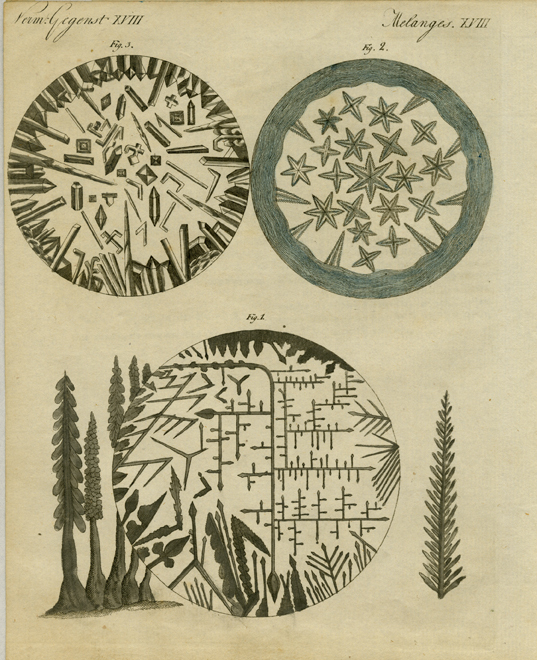 Today we are sharing three new additions to our inventory of natural history prints- beautiful crystal etchings from F. J. Bertuch’s “Bilderbuch fur Kinder.” An elaborate pictorial encyclopedia, Bertuch’s work was designed to teach children about the physical world- its geography, natural phenomena, flora and fauna- as well as the many people inhabiting the world, with notes and images on customs, dress, architecture and technological advancements. The series appeared in 12 volumes, released in monthly installments from 1790 to 1830. A total of 1185 pages and an impressive 6000 hand-colored illustrations make up this beautiful compendium. “Bilderbuch” was published in German and French, and was one of the first pictorial encyclopedias created – a landmark in educational publishing. 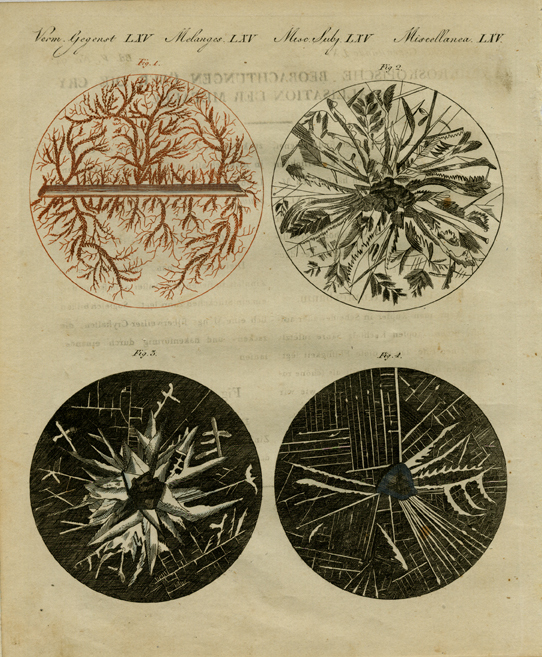 Of all the amazing and rich content in each volume, Bertuch made special effort to emphasize and include as many illustrations as possible, believing that children would learn best from precise and true representations of science. We hope you enjoy these prints! Verm, Gegenst. XVIII. Meanges. XVIII (crystals). Published by Landes-Industrie-Comptoirs, Weimar. Etching, hand colored, 1792-1810. Image size 7 3/4 x 6 3/4″ (196 x 172 mm). Good condition with original hand color. LINK. Verm: Gegenst. XVII. Meanges. XVII (crystals). Published by Landes-Industrie-Comptoirs, Weimar. 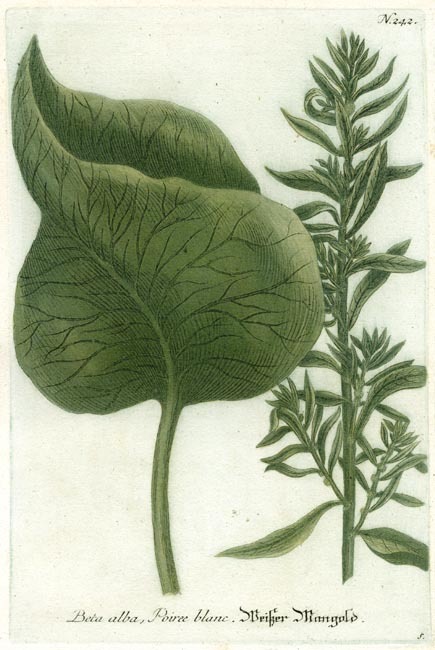 Etching, hand-colored, 1792-1810. Image size 7 1/2 x 6 3/4″ (190 x 172 mm). Good condition with original hand color. Accompanied by text sheet in French and German. LINK. Verm. Gegenst. LXV. Meanges. LXV (crystals). Published by Landes-Industrie-Comptoirs, Weimar. Etching, hand-colored, 1792-1810. Image size 7 1/4 x 6 5/8″ (185 x 169 mm). Good condition with original color save light offsetting. Accompanied by text sheet in Engllish and Italian. LINK.